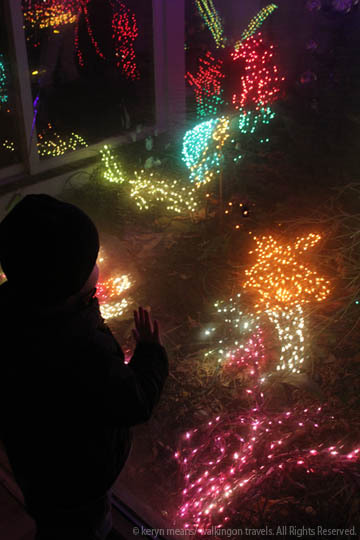 What happens when you bring together 275 volunteers, 9643 hours and over 500,000 LED lights? 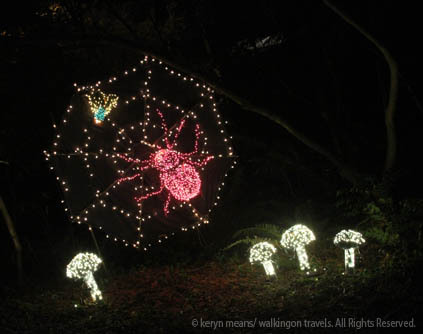 Why the 18th Annual Garden of d’Lights at Bellevue Botanical Gardens of course. Add in a few harried, just getting off of work parents and some ramped up kids and you get an extra dose of Christmas insanity…ahem, I mean cheer. I’m starting to think that maybe, just maybe, we have gotten a little Christmas light crazy. Ok, so maybe not we, probably just me. It seems to be my focus lately. I like them, Dek likes them and Mike is always happy to come along for the ride. 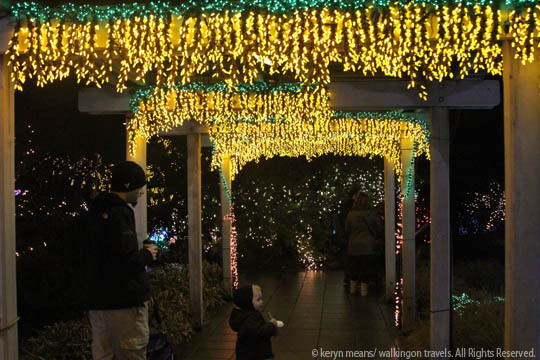 We’ve seen the 12 Days of Christmas at Butchart Gardens. We are headed to the old John Wanamakers (now Macy’s) in Philadelphia later this week. I haven’t even gotten to Candy Cane Lane in Seattle yet! 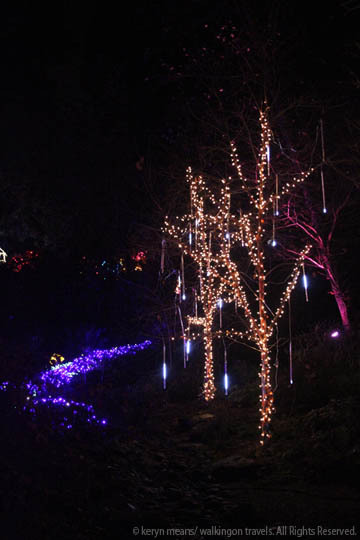 What better way to keep our holiday light zeal going than to head to the Bellevue Botanical Garden just across the bridge from Seattle? I had no good reason why not to go, so we hopped on over to join my friend Nic and her kids for an early evening stroll. Stroll might be too casual of a word for what actually took place. The scene at the garden was a little crazy. Even with a grandma and two dads in tow, we almost lost the 3 kids a few times. Parents raced after their little ones, couples stood around checking out the lights while smaller kids pushed their way through them for a front row seat. Not exactly the relaxing holiday event I might have been envisioning. I heard that last year they just let people wander willy-nilly. This year there were arrows pointing visitors down a predetermined path. Given the crowds and hoards of tired parents, I can’t even imagine a visit without an arrow showing us the way. If this was a bit overwhelming, what was last year like? As chaotic as the scene might have been, the kids just loved it. We played spot the animal to find turtles, spiders, monkeys, parrots, dragonflies, an alligator and even a peacock. The Aquarium in the visitors center was very impressive with its jellyfish, crabs, octopus and tropical fish suspended in a glass tank. Towards the end of our walk we came upon Snap d’Dragon. This little guy blew smoke out of his nostrils at the tip of his 135 strings of mini lights, which only took 200 hours to create. The kids shrieked for joy every time a new puff came out. This little guy was definitely a crowd pleaser. 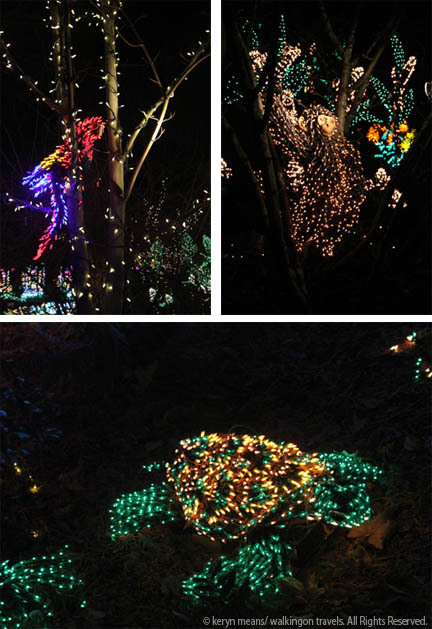 It didn’t take long to walk down the path and see all of the light displays. I’d say it was just enough time to get our fill for the evening and get out before too big of a migraine set in (those LED lights were really bright!) We were home in time for a quick dinner and a slightly late bedtime. 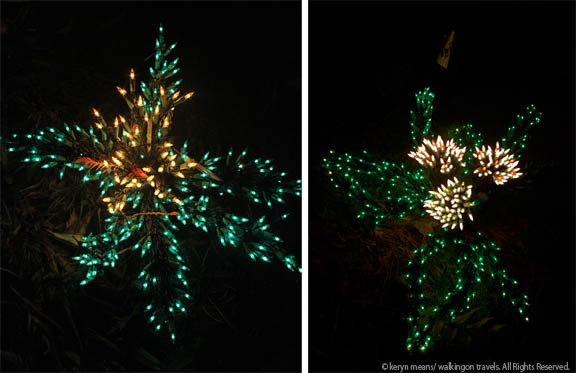 Next year, if I am still on my Christmas light kick, I will probably opt to check out the garden earlier in the week and earlier in the season before everyone, like me, tries to cram every last holiday event in before Christmas. With a little more planning this might have been a much different and slightly less rushed experience. I will admit, it was pretty impressive to see what so many people coming together can accomplish though. Kudos to all those volunteers, who even as we walked through, were putting in some hours herding visitors down the correct paths. Kids enter free. Adult admission is $5 (helps to pay the electric bill). Credit cards are accepted. Coffee beverage are available in the visitors center (also where the “Aquarium” is located) Bring cash or local check. The coffee shop does not accept credit cards. Show up early or just before close. The garden fills up quick. I definitely think you’re right that it’s too late in the season for any relaxing holiday events. ‘Tis the season for chaos among children. I guess that’s why they get two weeks off school…nobody would be listening to the teacher anyways. Sounds like they’re making improvements each year though. That’s always a positive sign. Considering the low cost, it looks like an enjoyable evening out. Oh I would love to see those lights!! 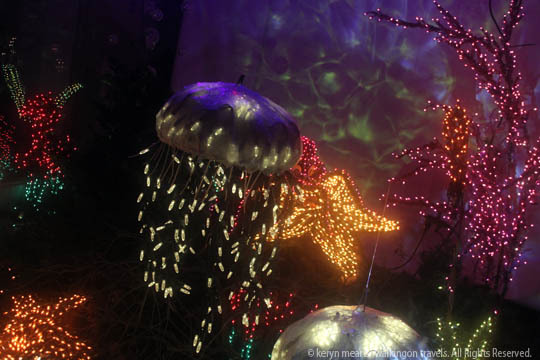 I love the idea of taking kids for a walk through all of those amazing displays. Funny but this year doesnt seem like Christmas – maybe because we have stayed away from the stores and not listened about what to spend our money on! I love xmas but just wished it was about giving instead of buying the next biggest thing! 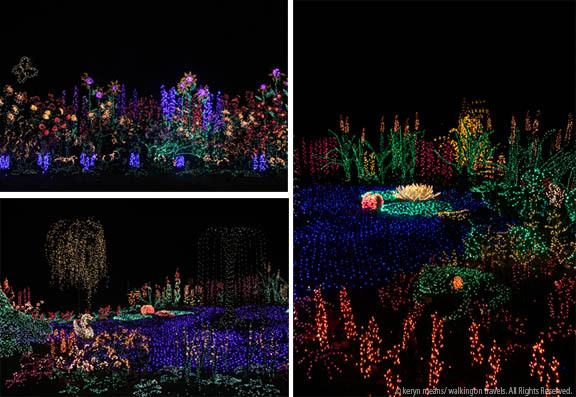 I miss not going for a drive to see the lights displays so thank you for sharing yours. Beautiful light displays! I think I’d go mad trying to keep track of excited kids racing around in the dark amongst those lights. Fantastic lights! Glad you didn’t lose anyone!